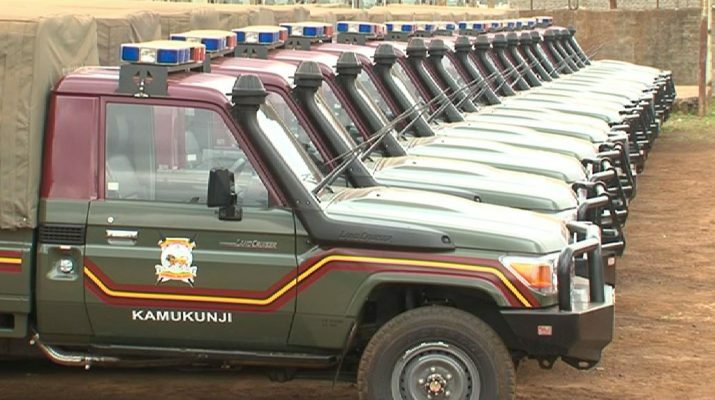 National Police Service receives 800 vehicles to boost security, meet immense shortage – Kenyatta University TV (KUTV). All Rights Reserved. The National Police Service (NPS) has received a batch of 800 vehicles from Toyota Kenya under the governments pilot lease programme. The vehicles are aimed at boosting national security and meeting the shortage in the service. The delivery which is expected to continue for two weeks is also expected to equip and motivate the police service through investment in security infrastructure and in mobility of police operations. The delivery was done under a pilot lease programme that commenced in year 2013 when the Kenyan Government through the National Treasury awarded Toyota Kenya the tender. The tender for the initial 1,100 vehicles was awarded to the company in October 2013 to the tune of Sh 6 billion, with the first batch of the vehicles being delivered in December of that year. National police was selected as the ideal institution to carry out the programme owing to its nature of operations. Currently, the service has a need for 4,500 units of police vehicles with the shortage expected to rise to 11,000 in the next 5 years following additional administration structures, additional constitutional offices and a strengthen and criminal investigations department. Speaking during the delivery done at Kenya Vehicle Manufacturers Company in Thika also witnessed by Assistant Secretary to the National Treasury David Malonza, Toyota Kenya’s Managing Director Arvinder Reel said that more than 2,500 police officers have been trained on product operation, lease procedures and safe operation of the vehicles in 41 counties. He said that the project has immensely contributed towards the sectors quest of building a vibrant motor vehicle industry as well as meeting the Kenya’s growth needs. He said that security being the government’s bedrock for sustained social economic development for the country to realize complete industrialization by year 2030, the program will benefit the country from cash flow management, professional fleet management, driver training and aftersales support.